The Spanish Camino de Santiago is one of THE most ancient walking routes in the world. Ever since the C9, the French Way has led thousands of pilgrims on an 800km journey across northern Spain, winding from the Pyrenees across the wheat fields of old Castile to pass through Leon, the seat of Spanish Kings, full of soaring cathedrals and hushed convents, before entering Galicia. The route then builds to a spectacular finale at Santiago de Compostela's majestic Baroque cathedral, the last resting place of St James the apostle. Your walk begins in Leon and, in keeping with the pilgrimage route, you walk daily along farm tracks, paths and country lanes, enjoying sociable lunches in restaurants en route. You'll stay in an astonishingly diverse range of properties including restored parish houses, converted water mills and stylish farmhouses, all packed with period features. We've included transfers after breakfast on the first three walking days, after which you'll walk all the way to Santiago. The sense of achievement on arrival is immense, and sharing in this tradition with your fellow pilgrims en route is incredibly rewarding. Everyone on the Camino has a Pilgrim Passport that can be stamped in bars, hotels and churches along the way to qualify for a certificate from the official Pilgrim Office in Santiago. You'll notice a profound and heart-warming camaraderie with other walkers, as day by day you fall in and out of step with people from all over the world, some of whom have been walking for months, covering hundreds of miles! You'll also find complete strangers cheering you on and wishing you 'Buen Camino!' ('Enjoy your walk!'). Walks on this holiday are on village streets, country lanes, farm tracks and rural paths. Walking boots are essential. Walking poles are recommended. 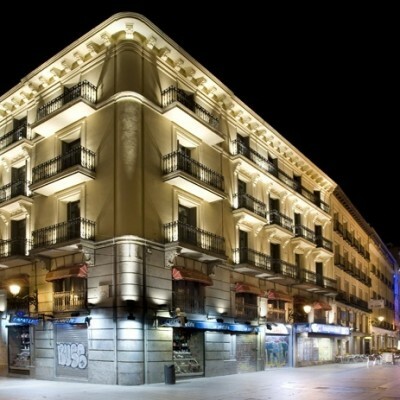 Arrive at your historic hotel in the heart of Leon. There are masses of restaurants and tapas bars on your doorstep, so we've left the choice up to you for dinner tonight. Your day starts with a guided tour of Leon's magnificent Gothic cathedral, which is often called the 'House of Light', and a visit to the Basilica of San Isidoro, one of the most important Romanesque churches in Spain and resting place of Leon's mediaeval monarchs. You will then receive your Pilgrim Passport at the local albergue and we'll provide a transfer (1hr) to Cruz de Ferro, the highest point on the Camino, marked by a pre-Roman cross. The Camino winds downhill through fragrant pines where once the Knights Templar protected pilgrims from bandit attack. A path lined with wild chestnuts, cherries, peppers and fennel leads to Molinaseca and your hotel. After a short transfer (30 mins), you ascend the Rio Valcarce valley, climbing into moody oak woods strung with lichen and strewn with early purple orchid. 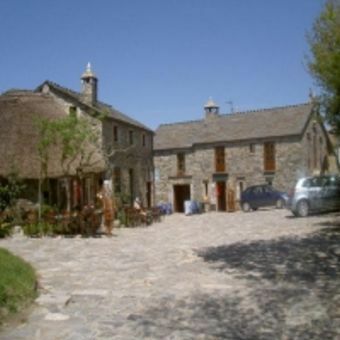 O Cebreiro is an C11 village in the heart of the Cordillera Cantabrica. Walk to the viewpoint above the village for a perfect sunset and views over four ranges of hills then return along the narrow, cobbled streets, past traditional thatched houses known as pallozas. After a short transfer we drop you off at Triacastela. As the Camino meanders between heather-clad villages overlooking the Monastery of Samos, you can hear the bells ringing. On reaching Sarria - the antiques capital of Galicia, you'll be whisked to Javier and Raquel's elegant country rectory (10 mins), complete with chapel and al fresco dining patio area. A Roman bridge leads out of Sarria up the Celerio Valley, where you'll traverse the hamlets of the southern flank of the Sierra del Paramo. Descend into Portomarin - the original village was drowned by the Belesar Reservoir, and some remains still shimmer below the surface! Drop into Portomarin's church then follow the Torres stream, passing between cornfields lined with ox-eye daisies. Stamp your Pilgrim Passport in country churches dedicated to the Order of St James before arriving at your beautifully restored rectory. Country lanes lead past fortified farmhouses into the hillside town of Palas de Rei (Palace of the King) as you enter the province of A Coruna. You'll pass typical, raised Galician granaries, and chickens scamper across narrow streets as you enter vineyards, with views east to the Montes del Vacaloura. Today's first stop is Melide - a thriving country town where tavernas brim with locals enjoying Galician seafood in specialist pulperias (octopus restaurants). Drop into the Romanesque church to admire the frescoes, before lanes lined with bright yellow celandine bring you into the lively market town of Arzua. Continue on to your elegant manor house, surrounded by tranquil countryside, just outside the town. Arzua's colonnaded streets lead into open country where local farmers wear berets as they tend vines and build haystacks with pitch forks. Your route rises and falls through river valleys, crossing rushing streams. This evening you can marvel at Javier's breathtaking converted water mill, where original machinery has been turned into spectacular period features. Excitement mounts as you set off towards Monte do Gozo (Mount of Joy), where pilgrims of old caught their first glimpse of the spires of Santiago. On reaching Santiago's historic centre, congratulations are everywhere as a steady stream of pilgrims reach their journey's end below the cathedral's spectacular Baroque facade. Drop into the Pilgrim Office to collect your certificate if you wish, before checking into our historic hotel near the old marketplace - still a riot of colour! The Posada Regia is perfectly located in the centre of Leon, just off the main (largely pedestrian) street and around a five minute walk from the impressive central cathedral. The hotel has two buildings on adjacent streets. The main building is where the restaurant and bars are located. Once inside you enter the world of 'old Leon' as even part of the original Roman city wall has been incorporated into the structure of the new building. The atmosphere is rustic with lots of timber and tile floors, and this building is next to a lively square where it is pleasant to sit out for drinks of an evening. The second building (where Headwater rooms are located) is 20m down a quieter street. Bedrooms are attractive with bold colours and smart new bathrooms. 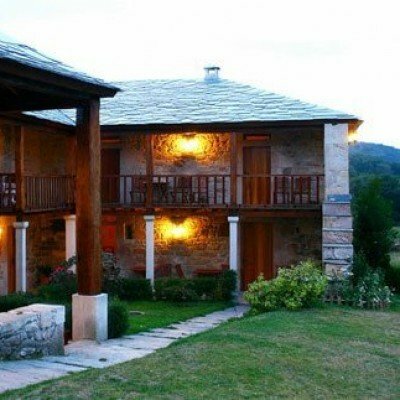 El Palacio is perfectly located on the banks of the river in Molinaseca and in a restored building that was formerly known as the Casona de Don Pelegrin. Recently renovated the modern rooms offer flat screen TVs and WiFi access. The Valina family have run much of the accommodation in O Cebreiro for generations, and the village certainly looks like time has stood still. With amazing views in all directions, this tiny place is one of the most charming on the Camino. There are rooms in three different buildings, each just 20m apart and made from the heavy, grey stone typical to this area. One building is an C11 monastery and is actually connected to the little church next door so the monks could walk directly between their rooms and their pews! Rooms are light and more spacious than you would suspect in such small 2 storey buildings. The main restaurant is next to the cafe and bar, often filled with characters from the village. English is in short supply but there are so many nationalities passing though here you will always find someone to help! A rectoral in Spain is the equivalent of a parsonage in the UK. A grand home, often in a picturesque location built of attractive old stone. 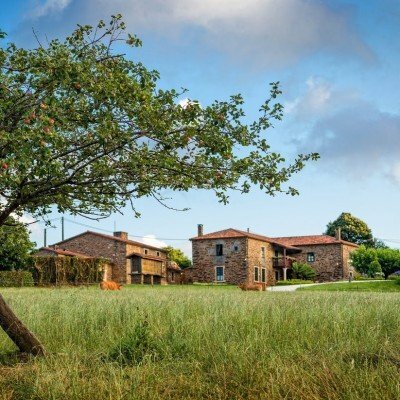 Such is the case with The Rectoral de Goian - a gorgeous property set in isolated countryside in landscaped gardens that are just too perfect. Javier will collect you from the Hotel Roma cafe opposite the station in Sarria and bring you the 8km to the hotel, and will also drop you off in the morning in the same place to continue the walk. The Rectoral building is horseshoe shaped - it has an open patio and balconies facing the garden so it is ideal for eating al fresco in the evening. There is even a tiny chapel in the garden that is still used! Bedrooms are gorgeous with stone walls, beams, wooden floors and modern bathrooms, all with views on to the patio or the garden. Raquel and Javier don't speak English, so a phrase book will come in handy here too. This eco-friendly hotel is located on the banks of the Mino river. 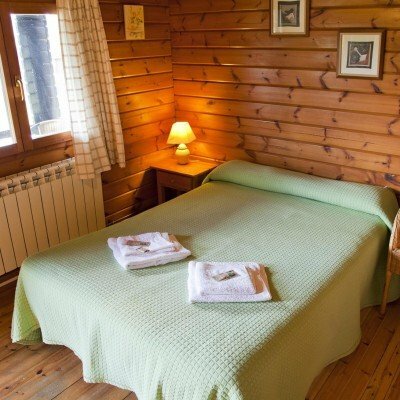 The rooms are located in the Main building and are decorated with wood panelling. Set deep in the countryside directly on the Camino, on a hillside with fabulous north facing views, this ancient light stone ruin has been restored by Susana and Cesar (a local vet). The sloping garden gives all the rooms pleasant country views, and the public spaces are very effectively designed to maximise natural light and make the most of the views. The 9 bedrooms are light and spacious with black and white photos on the walls, wooden floors and some striking designer touches that you might not expect in a building of this age. In the tiniest village of just a few houses, Jesus Cardelle's rustic country Turismo Rural is a popular stop on the Camino. 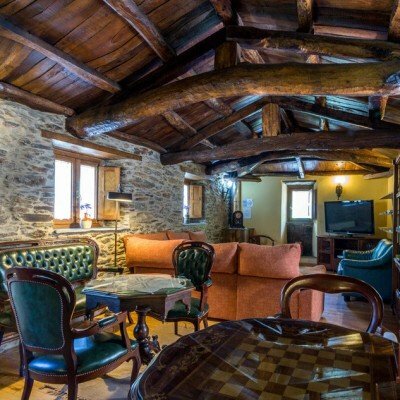 The house was originally a farm, and has an old world charm about it with tiled floors and wooden beams throughout. The garden outside is always full of passing pilgrims having a drink in the sunshine, and playing Jesus' typical in house Galician skittle game. This is a simple village and a simple hotel, full of rustic charm. There is no English spoken here. Juan Manuel Duque took on this ruined Galician stately home on the outskirts of Arzua as a retirement project several years ago, and has restored it to it's former glory using original materials and creating an atmosphere of perfect peace and tranquillity. Most rooms are set into the old stables around a central courtyard, with several also in the main house where the luxurious public lounges can be found on the ground floor. The walls are solid stone, the beams and roof all ancient, and the dining rooms sports a giant fireplace and other original features. 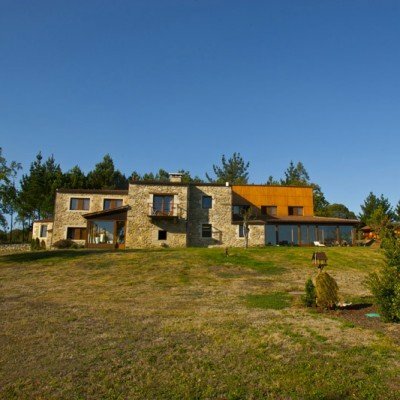 The entire complex is set in landscaped grounds on the edge of Arzua so it is around a 10 minute walk from the centre where all the shops and banks are located, as well as your onward route to Santiago. 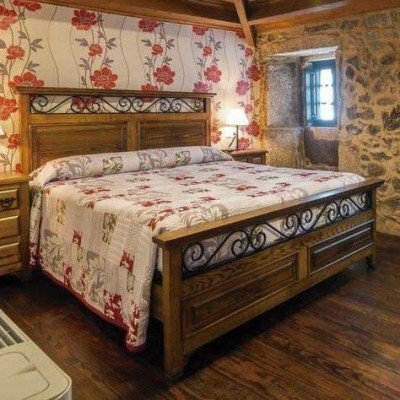 Just off the Camino (you will be picked up from Pension Compas which is on the Camino by Javier), can be found some of the loveliest and most unusual properties to stay in, and this is one of them. Hidden in the backwoods and valleys this ancient mill sits next to a rushing river and weir, instantly relaxing you with the sound of running water. The bedrooms are on the top floor as you enter (you enter on the second floor as it is built on a steep hill), and all are utterly charming with beams, stone walls and dark wooden furniture. Downstairs, much of the heart of the mill has been retained, with giant wheels and massive machinery blending perfectly with the bar and dining area and looking quite spectacular. The open riverside garden is perfect for a drink, and the entire place feels as if it is a mythical secret hideaway. Javier will drive you back to the Camino (10 minutes) in the morning. Just on the edge of the historic centre in Santiago de Compostela, the Virxe da Cerca sits just below the old market - it is still used by the locals daily and is definitely worth wandering through. Our superior rooms are in the grand old 4-storey building that backs on to an extensive garden at the back. The breakfast room overlooks the garden while the in house restaurant is on the ground floor in the depths of the building with solid stone walls and a cosy atmosphere. It is only a 5-minute walk into the heart of the old town so it is perfect for exploring, and feels like coming back to your very own stately home in the city. The price includes a rail ticket between Madrid and Leon however the start point for this holiday is the Hotel Posada Regia in Leon. Walking the Camino was a lovely experience. Having the luggage moved everyday and prearranging accomodation and meals took away the stress of travelling. Wonderfully organised and relaxing holiday, apart from the challenge of walking every day, which is what we paid for!! Thank you! An enjoyable way to experience part of the Camino with a mix of accommodation to stay in along the way and the opportunity to walk along several interesting parts of the route. We had a very enjoyable trip, with great walking in beautiful locations, meeting interesting people, eating some delicious meals and we appreciated having our luggage transported! We thoroughly enjoyed the entire set-up of this holiday. Our companions in the group were friendly and good company. The walk was spectacular with some of the more boring bits done by vehicular transfer. We were also extremely luck with the weather, it only rained once for 5 minutes! We felt a real sense of achievement when we arrived in Santiago de Compostella. Quite demanding. 9 days is a long walking holiday. A very good trip. Where scores have been less than excellent this is because I think the hosts could welcome guests with an offer of drink after a day of exertion - including making tea/coffee available. At times the hosts were not visible and when they appeared it felt awkward asking for a service of this kind with the exception of Pazo Santemaria and Casa los Semoza (the latter had a bar). Some of the accommodation may not be conveniently located so meant waiting around to be picked up. An arrangement whereby the guest could have a taxi as he/she arrived at collection point would be better. Also in some places it was cool/damp weather and bed linen felt a little damp. Heating not always switched on (noticeable feature when one is tired) and I had to ask at one place for it to be put on as I was quite uncomfortable. However, luggage was always transported exactly which was reassuring. Blanca the guide in Leon was excellent and Headwater have made a very interesting programme of accommodation - full of interest/quirky and beautifully located. Thank you. We are 2 female friends and booked single occupancy of rooms. We felt hotels were well chosen and variable, but all interesting and overall comfortable . We got a bit sick of the Pilgrim 10 euro menu, but also had some superb meals. The walking was excellent, and easier than we had expected. We enjoyed the independence of being self guided. There were a few minor faults in the daily walking guide and we have offered to come in and point them out. We live in Chester and decided to Travel from Liverpool to Madrid and spend a night there rather than at Heathrow. We did find that the schedule on Day 1 was a bit over-heavy. Everyone was exhausted that night. But, overall this was a Brilliant holiday! And May was a very good choice this year. The Camino is a wonderful experience. The walking can be challenging so you need to practice before your holiday. The accommodation was mixed, breakfast tended to be a disappointment. The star of the show for us was Rectoral de Goian. A wonderful place with great food and a sincere welcome. 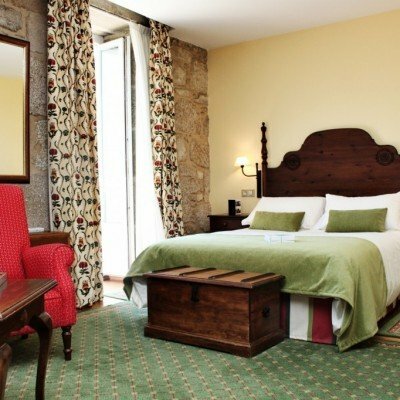 Overall the accommodation is lovely and given the standard that some of the pilgrims use it is pure luxury. The bag transfers and pick ups ran like clockwork. This is my 10 th Headwater holiday,this time I convinced three friends to walk the Camino de Santiago with Headwater. Our group of four were very pleased with Headwater and are looking at more holidays with them. We loved this walk. Accommodation on the whole was as good as it could be given the isolated nature of some places. We were particularly impressed with the helpfulness of staff at Headwater when BA cancelled our outward flight the evening before our journey so we didn't miss any of our holiday. The arrangements went very smoothly. The weather in mid July was very hot-unusually so according to locals- so if you suffer from the heat, earlier or later might be better! Well organised; great choice of places to stay with walking well directed and right amount of effort per day. The Camino is not the most beautiful route we have walked but communion with fellow travellers made it feel special. Only comment would be O Coto. Finished short walk to Casa de la Somoza by lunch and really not much to do that afternoon. While the hotel was adequate it was not the sort of place you could amuse yourself in for an afternoon. The common parts were a bit gloomy. We went for a walk! that afternoon. A pity about baggage handlers' strike in Madrid, main problem was that we had our walking poles taken from us in Stansted in spite of the fact that my husband had checked with Ryanair that we could get them through security. This is categorically not true. We had to store our poles in Stansted at cost to ourselves and buy poles in Leon. A superb holiday experience that we will always remember. Headwater's advice & organisation was faultless. Excellent experience. A privilege to walk through such a beautiful and little known part of Spain! This is a classic walk which also includes extra interest such as a tour of Leon and the ability, due to transfers, to stay in some lovely establishments. This part of Spain is very beautiful and we walked through lovely little villages and farms. The flowers, particularly on the first day, along the way were stunning. Lots of places to get snacks and drinks. The Camino is so well signposted that there is very little need to consult notes and maps so it is easy to enjoy the walking. It was an excellent holiday and very well planned so that we had a good morning sightseeing in Leon*, walked the best stretches of the Camino and had an attractive balance of accommodation. * We were a bit concerned about starting the 1st days walk so late in such heat (30c+), but we managed it! We were blessed with decent weather, and so enjoyed this 160km. very much. We found the O Munio De Pena a bit of a gloomy place, with Javier nowhere in sight until 8.30 that evening! The only other mild carp we have is at Sarria, where that last km. through the town was hard work. Could a pick-up closer to our entry into the town be considered? 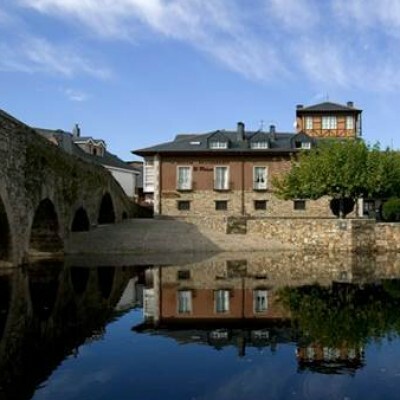 Also, going into Arzua, the Pazo told us that if Headwater had told us we could have phoned the Pazo for a taxi from our entry into the town to the hotel for 4 euros! This could have been very valuable info. as we were being chased by a thunderstorm at that time! We also recommend the taxi back to the starting point next day. This was a great holiday. It's the walks are fairly straightforward, but there are some long days. The arrangement by Headwater worked like clockwork. The hotels are well-chosen and generally of a good standard. Our favourites were the 2 rectorals and Paze Santa Maria. This was a great way to explore the Camino de Santiago. Overall it was a fantastic holiday - one of our best ever. We loved the Camino itself and our holiday was enhanced by the 6 others in our group. Our stay in O'Cebriero was horrid, as the community was celebrating its local saints day and the hotel/pub was in the centre of the long festivities, including lots of pulpo (octopus) being prepared, boiled and eaten and an amplified band striking up at midnight. Understandably on such a big occasion it took quite a while before we could access our rooms, and it was not possible to get our cases through the crowds for a time either. Unfortunately the refuge at the quiet end of the village was fully booked otherwise we would have stayed there instead. Headwater should warn clients arriving on that day what to expect. Felt could have walked further each day, especially in order to reach Santiago more comfortably to experience the pilgrim's service (we walked the final 21kms in 4 hours in order to do this) plus that last part is the least interesting part of the walk. Appreciated the care taken to make the first 3 days so interesting - very glad that started at Leon and not at Sarria - and very glad that stayed way out of Sarria as it's a rather depressing town! Found the trek down to the resort at Portomarin a pain - felt had arrived, at the river, then found had another good up and down km to do to reach the entrance. The manager/owner offered to drive us the next morning, which we all appreciated. All the taxi and other drivers were excellent, on time, friendly and efficient. Would especially like to mention Blanca, the guide in Leon; such a lovely and enthusiastic person with immense knowledge - we were expecting to be bored, but were totally immersed and hope to go back. We all agreed that it would be useful to have a list of taxi and other drivers' phone numbers as we often arrived 2 or 3 hours before pick up time. O'Coto was a pleasant hotel, it was just a pity that was sandwiched between 2 busy roads with a car dump nearby. It was also a bit damp, tho the owners put the heating on for us (we know they are new owners so maybe will be making improvements for next year), and was difficult to dry our washing - which we all did as were staying 2 nights there. I am being very pernickety here, as overall we enjoyed the holiday immensely and have enthusiastically recommended it to our friends. We thoroughly enjoyed the walking but preferred the days when the accommodation was actually on the Camino. The inconvenience and waste of time waiting for taxis in unpicturesque places at the end of a day's walking was irritating. Similarly starting a day with a taxi ride to get back to the Camino from remote accommodation was unsatisfactory. Fantastic, it was everyting I hoped it would be and more! Every Saturday from 27th Apr 2019 to 18th Apr 2020, for 10 nights. All dates are subject to availability, please contact us to check. This holiday is based on a minimum of 2 passengers. Due to the tailor-made nature of our holidays, we need a little more information in order for us to check availability for Walking the Camino de Santiago. Simply complete the form below and a member of our sales team will contact you (when it's most convenient for you) to provide availability information, travel options and an accurate price. Of course there's no obligation, but if you do wish to proceed with a booking they will be on-hand to assist you throughout the process.